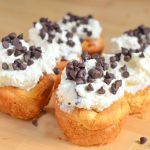 These Chocolate Chip Cheesecake Crescents are a crowd pleaser! The creamy no bake cheesecake is topped on a buttery, flaky, crescent roll from Pillsbury. Special thanks to Pillsbury for sponsoring this recipe. Mold the crescents in a muffin tin to look like cupcakes, make sure the center is hollow. Whip cream cheese, heavy cream, vanilla, and sugar.